For every e-commerce website hosted on the server, you should purchase and install an authentic digital SSL certificate. SSL certificates are used for establishing secure communication channels on the Internet and for verifying website identity: When users visit your secure online store, they are notified that your website is really what it claims to be and that all sensitive data, such as credit card numbers, will be transferred over a secure channel. 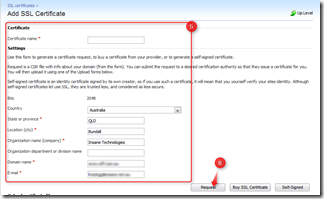 · Use a link in the Panel for purchasing SSL certificates. The link in the Panel, by default, refers to the MyPlesk.com online store which simplifies purchasing SSL certificates from Comodo, GeoTrust, Inc, and GoDaddy. This link can be modified by your provider to refer you to their own site. 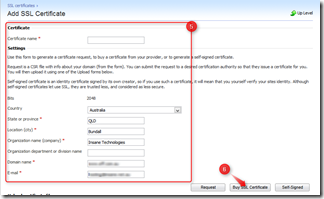 · Create a certificate signing request (CSR) from the Panel and submit it to the certification authority of your choice, which will create an SSL certificate for you. Click Secure Your Sites. A list of SSL certificates that you have in your repository will be displayed. Encryption level. Choose the encryption level of your SSL certificate. We recommend that you choose a value more than 1024 bit. The domain name for which you want to purchase an SSL certificate. This should be a fully qualified domain name. Example: your-domain.com. The website administrator’s e-mail address. a. Your private key and certificate signing request will be generated. Do not delete them. 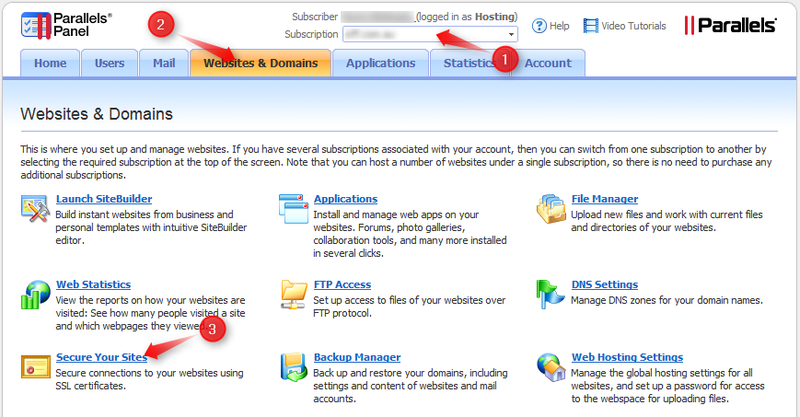 MyPlesk.com or another online store configured by the provider will open in a new browser window or tab. Register or log in to an existing account and you will be taken step by step through the certificate purchase procedure. Click Proceed to Buy and order the certificate. In the Approver E-Mail drop-down box, select the correct approver e-mail. a. The approver e-mail is an e-mail address that can confirm that certificate for specific domain name was requested by an authorized person. This is the e-mail address listed in the domain owner or domain administrator’s contact information in the WHOIS database. Once your certificate request is processed, you will be sent a confirmation e-mail. After you confirm, the SSL certificate will be sent to your e-mail. When you receive your SSL certificate, save it on your computer. 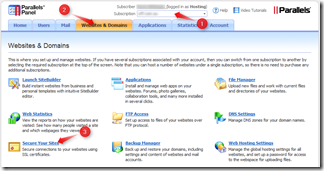 Return to the SSL certificates repository (Websites & Domains tab > Secure Your Sites). Upload the SSL certificate: Click Browse in the middle of the screen and navigate to the location of the saved certificate. 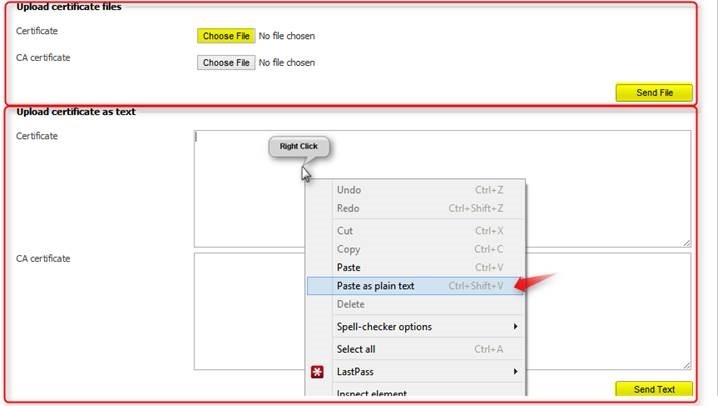 Select it, and then click Send File. a. This will upload and install the certificate against the corresponding private key. To install the certificate on a site, return to the Websites & Domains tab, and click the domain name of the website that you want to to secure. 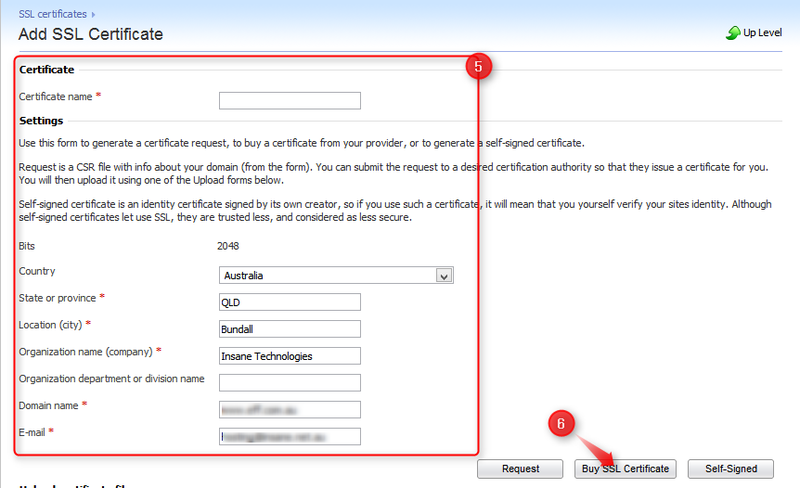 To switch on SSL protection, select the Enable SSL support checkbox. From the SSL certificate menu, select your SSL certificate and click OK.
Click SSL Certificates. A list of SSL certificates that you have in your repository will be displayed. Locate the CSR section on the page, and copy the text that starts with the line —–BEGIN CERTIFICATE REQUEST—– and ends with the line —–END CERTIFICATE REQUEST—– to the clipboard. Visit the website of the certification authority from which you want to purchase an SSL certificate, and follow the links on their site to start a certificate ordering procedure. When you are prompted to specify CSR text, paste the data from the clipboard into the online form and click Continue. The certification authority will create an SSL certificate in accordance with the information you supplied. When you receive your SSL certificate, save it on your local machine or network. Click Browse in the middle of the page and navigate to the location of the saved certificate. Select it, and then click Send File. i. This will upload and install the certificate against the corresponding private key. b. Copy the text that starts with the line —–BEGIN CERTIFICATE—– and ends with the line —–END CERTIFICATE—– to the clipboard. 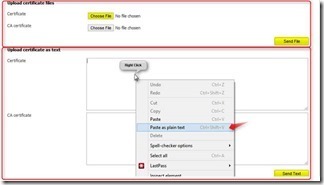 Right Click in the Certificate section and Paste as plain text, then click Send Text.